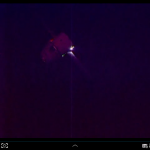 Well after a four month break I am pleased to say the blog is back and will be updated regularly. 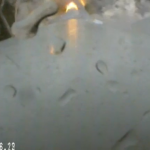 The reason for the long hiatus was due to a busy Christmas session quickly followed by the birth of my third daughter Annabella in January. 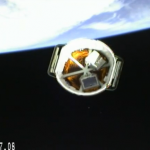 Today’s post will focus on last weeks launch, capture and berthing of the SpaceX Dragon capsule on it’s CRS-3 mission, but first a little history on why this is important. 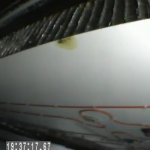 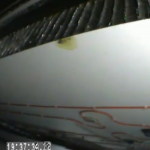 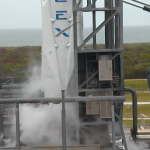 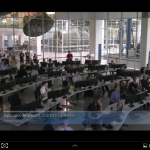 Dragon in SpaceX’s hangar, prior to vehicle mate. 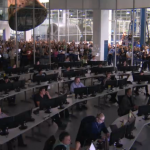 As most of you will probably remember on 21st July 2011 Shuttle Atlantis touched down for the final flight of the Shuttle program leaving the USA with no domestic ability to launch cargo or crew to the International Space Station. 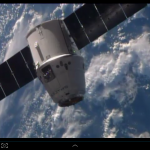 Today the picture has changed but the USA still has no domestic ability to reach the station with crew, however following the successful completion of the demonstration missions by SpaceX and Orbital under the Commercial Orbital Transportation Services (COTS) program the USA does now have cargo capacity to and from the station. 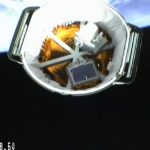 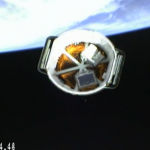 Before this week’s flight SpaceX has previously completed two missions under the Commercial Resupply Service Contract (CRS) known as SpX-1 and SpX-2, and Orbital have so far completed one known as Orbital-1. 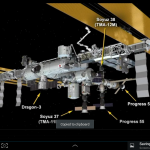 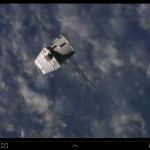 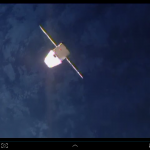 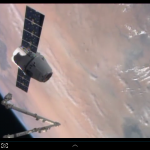 With the introduction of the Dragon spacecraft the USA again has the ability to return significant amounts of cargo from the station, an ability unique to Dragon as the only other vehicle that can return to earth the Soyuz has limited cargo capacity being design primarily as a crew transport.. 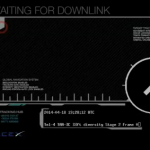 So why was this mission important? 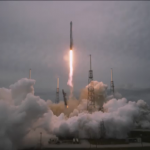 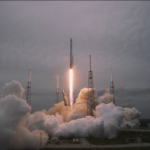 Since the last mission SpX-2 SpaceX have made a number of significant changes both to the Falcon 9 rocket and the Dragon spacecraft and despite several delays the launch this week was very successful. 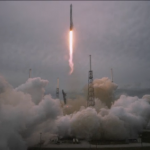 The Falcon 9 rocket for the first time flew with landing legs, these have been added to allow SpaceX to move a step closer to it’s goal of having a fully re-usable spacecraft in the future. 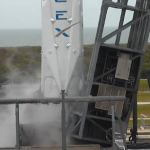 The landing legs not only allow the craft to land they also provide stabilization during the decent. 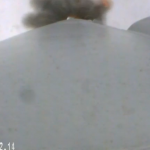 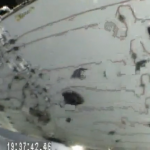 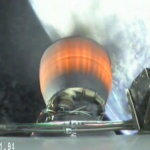 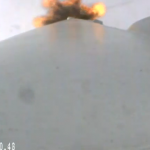 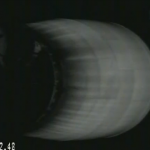 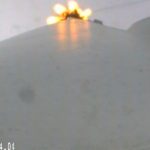 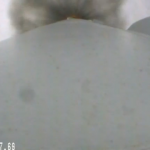 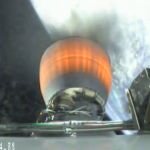 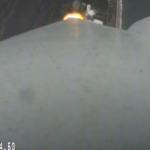 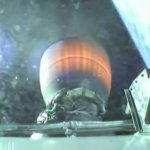 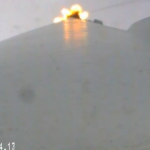 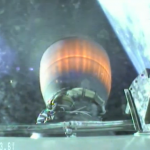 SpaceX has previously returned a first stage however during the final step the engines cut out before the roll rate was too high to allow the fuel to flow to the engines. 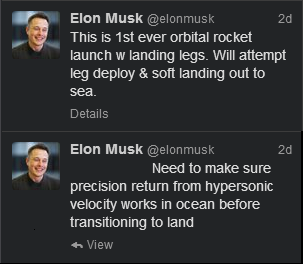 As Elon Musk CEO and CTO of SpaceX states to the right they will continue to perform ocean landings with the first stage until they can proof full control of the first stage, at which point return to launch pad is the goal. 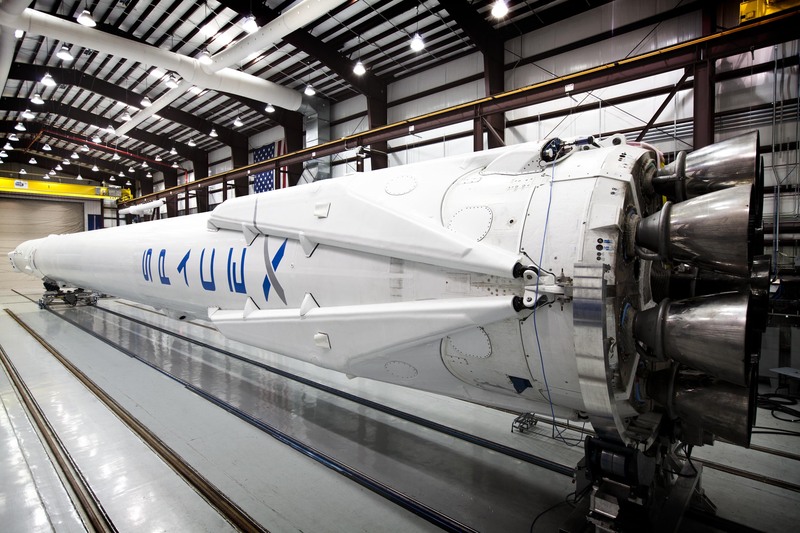 Falcon 9 in SpaceX’s hangar with landing legs attached. 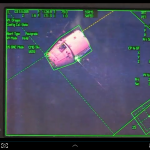 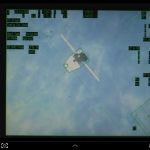 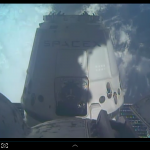 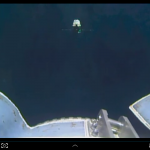 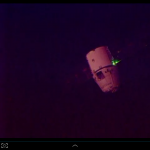 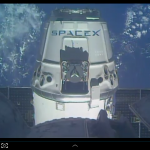 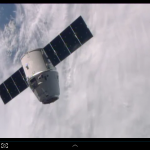 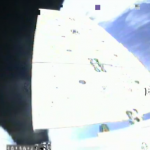 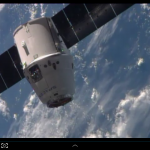 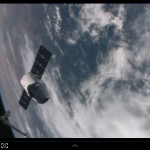 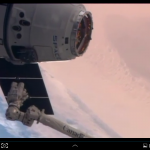 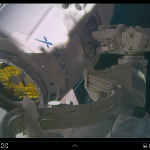 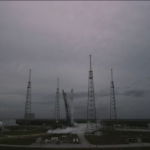 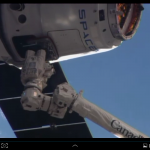 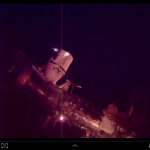 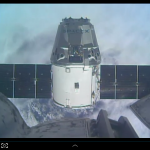 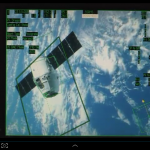 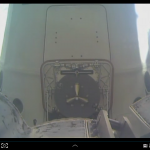 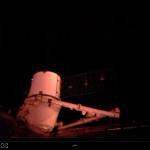 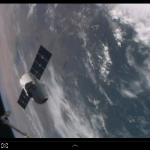 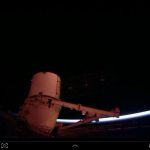 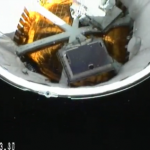 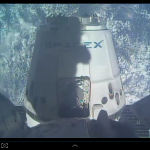 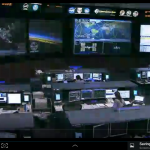 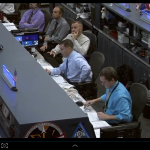 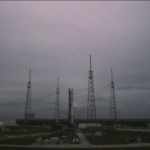 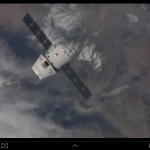 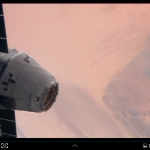 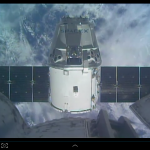 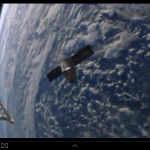 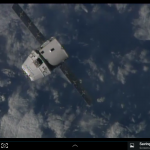 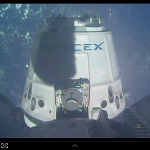 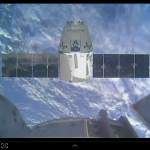 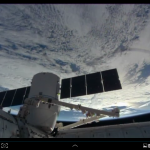 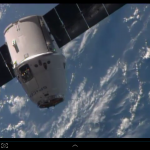 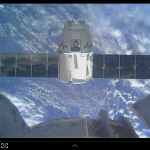 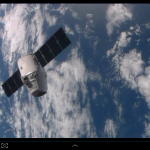 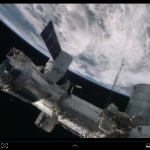 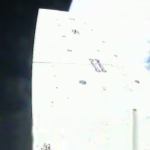 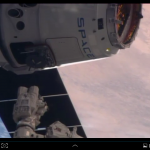 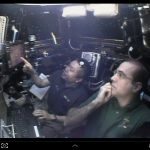 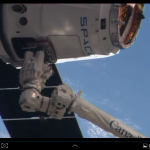 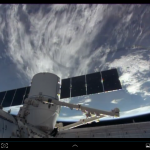 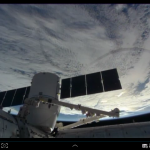 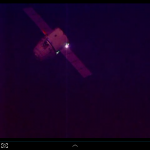 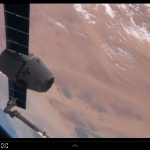 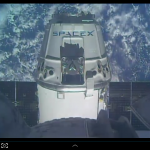 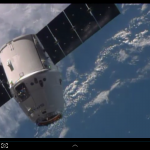 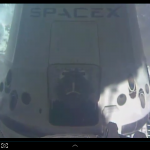 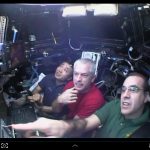 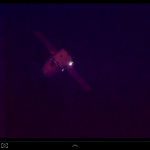 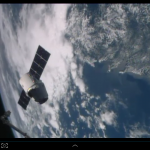 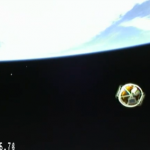 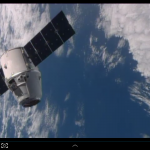 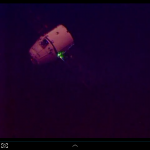 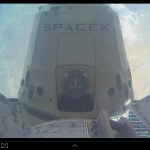 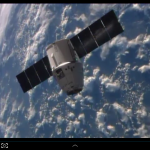 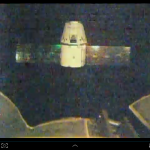 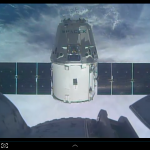 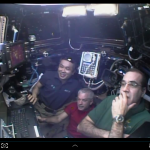 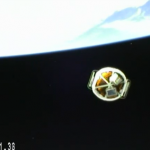 This is the fifth Dragon mission so far, the first two under the COTS program and the rest under the CRS program. 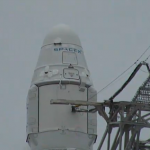 From the outside this spacecraft looks similar to the previously launched spacecraft however it has undergone a number of significant upgrades including upgraded avionics, redesigned cargo racks to supply more power to cargo, additional freezers to carry more critical science payloads and the ability to provide power to un-pressurized cargo carried in the trunk section. 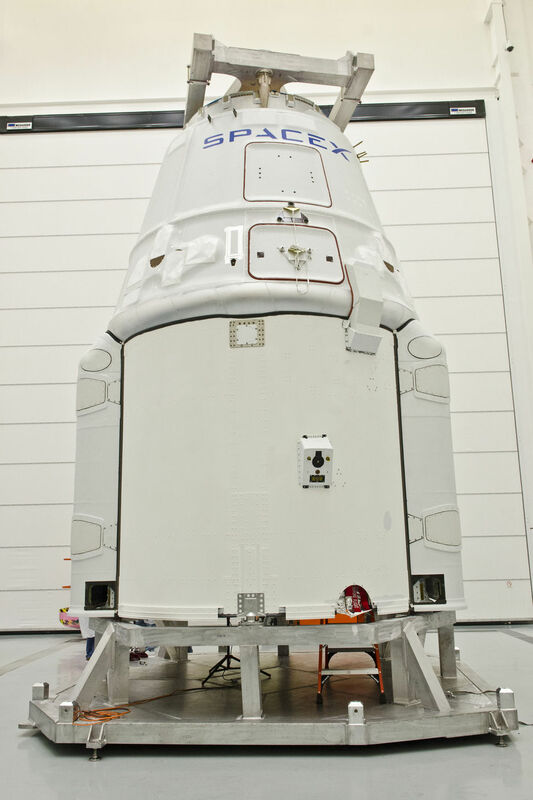 Originally scheduled for December 2013 the SpX-3 mission has been delayed a number of times due to various conflicts and changes. 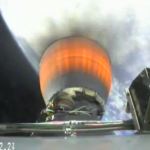 Once all of these conflicts and changes were resolved a new launch date was planned for April 14th, however that was aborted approximately one hour before liftoff due to a Helium leak on the Falcon 9. 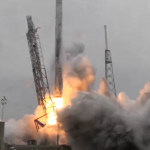 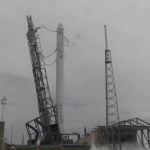 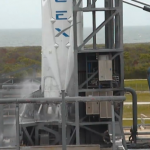 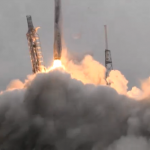 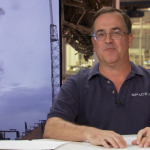 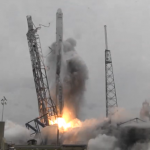 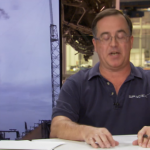 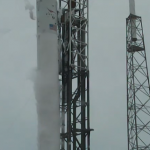 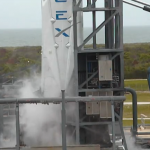 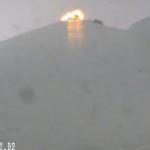 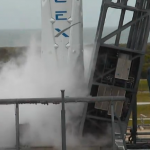 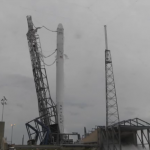 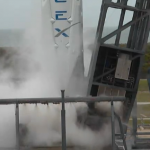 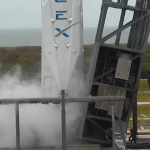 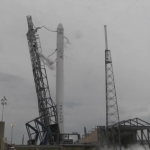 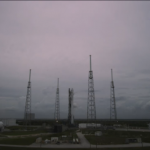 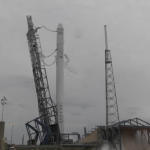 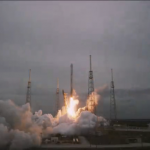 SpaceX resolved this and the launch was re-scheduled to Friday April 18th. 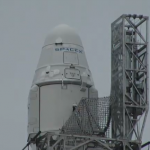 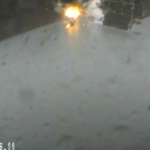 The weather forecast for the launch was only showing a 40% chance that they would be able to launch however SpaceX continued ahead with the countdown and were able to liftoff on time as the weather improved throughout the afternoon. 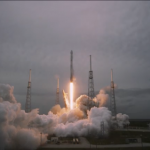 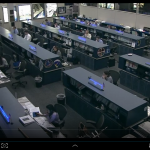 Following the final pole of the mission team the spacecraft entered the final minutes of the count down and lifted off at precisely 19:25:22 UTC as expected. 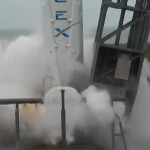 The nine Merlin 1D engines roared to live lifting the rocket from the pad towards it’s LEO destination. 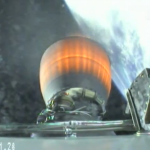 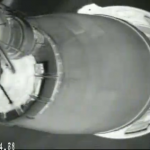 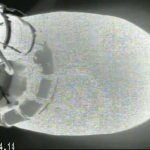 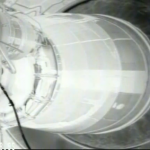 Three minutes after liftoff the first stage had completed it’s initial task and separated to allow the second stage Merlin 1D Vacuum engine to take over and propel Dragon the rest of the way to orbit. 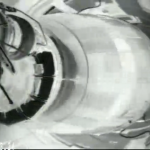 Unlike all the other rockets in use today the first stage still had tasks to perform including a deceleration burn that slow it down enough to perform a controlled re-entry, after this the landing legs deploy and the spacecraft again fires it’s engines to allow a controlled decent. 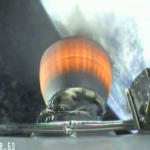 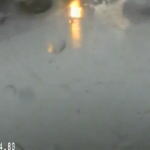 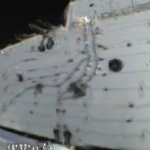 Initial reports from Elon Musk indicate that the spacecraft successfully returned to the Atlantic ocean with almost 0 role rate. 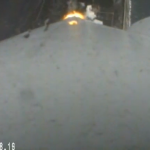 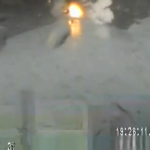 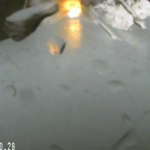 Due to high sea’s in the landing area we are not currently sure how much if any of the first stage was actually recovered by the ships that were waiting nearby however this is a promising step towards lowering the cost of launching spacecraft. 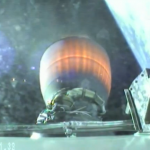 Meanwhile in space the second stage completed it’s mission and nine minutes after launch the Dragon spacecraft was successfully deployed in orbit. 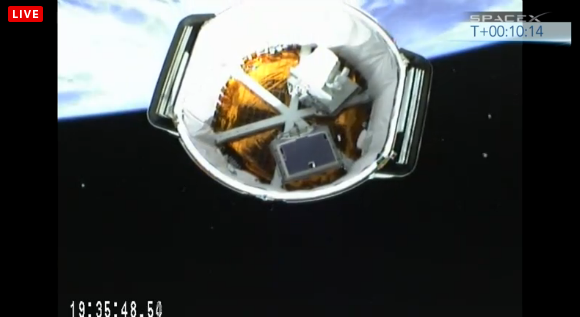 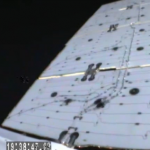 Several minutes later we watched as the Solar Array’s successfully deployed and the spacecraft began it’s journey towards the International Space Station. 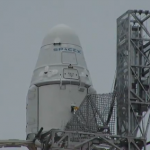 During the press conference after the launch Elon Musk did state that they had an issue with one of the Dragon thrust chambers but that had since been resolved. 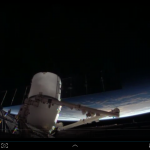 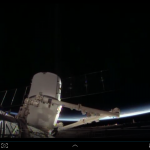 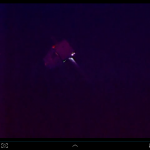 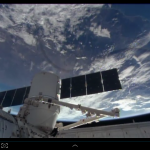 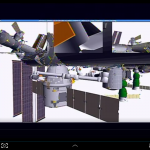 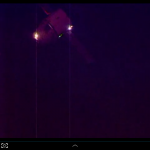 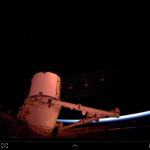 Eighteen hours after launch the spacecraft approached the ISS and was successfully captured and berthed to the station. 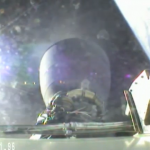 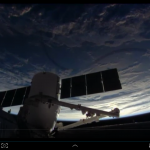 Below are a number of images I capture from the live stream provided by SpaceX during the launch, capture and berth of the Dragon.